Sure, there are dining options on Van Brunt Street in Red Hook. But for a real Red Hook treat, take thee to the Red Hook soccer fields. Maybe you've heard about the little gathering at the soccer fields at Clinton and Bay streets every weekend? Perhaps you've wandered past or driven by and wondered what all those little tents were about? 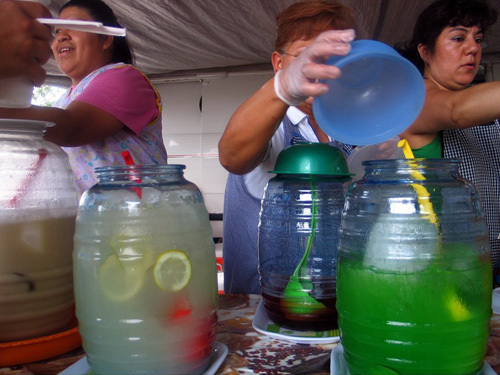 Well, every weekend dozens of vendors set up these tents and they constitute a virtual culinary tour of Central America. It may be New York City's most incredible and authentic street food experience, and one that you probably won't find replicated elsewhere. (We say "may be" and "probably" only because we don't know what other treats may lurk somewhere else in Brooklyn or Queens or the Bronx about which we don't know.) Some of the weekend restaurants at the soccer fields have been doing business in the same spot for years. In any case, the Porkchop Express blog has been posting what now amounts to a superb guide to some of the little restaurants and the food they serve. It's hard to read without laying plans to head to this part of Red Hook. A tasty treat hailing from South-Central Mexico, this flat, oblong cake of masa (moist cornmeal dough) is rolled, pressed, stuffed with a thin layer of black bean, pressed again, and thrown on a griddle until nice and crisp. You can top them with a bit of salsa picante and grated queso anejo, or go the whole hog and pile on meats, chilies, onions, sour cream, and whatever else lies within reach. Meanwhile, 423 Smith is also featuring some wonderful photos of the dining scene down at the soccer fields in an excellent photo feature called Spicy Mangos and More. 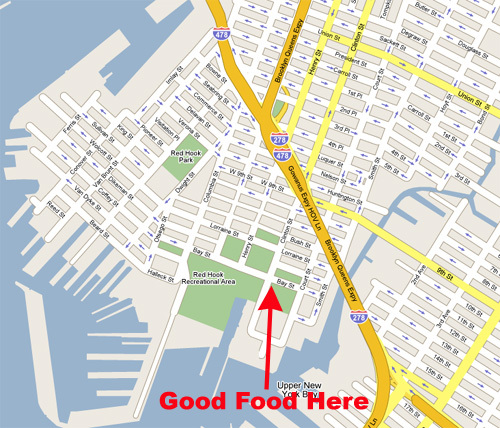 If you don't know Red Hook, the map below might help a bit in finding this food treasure.